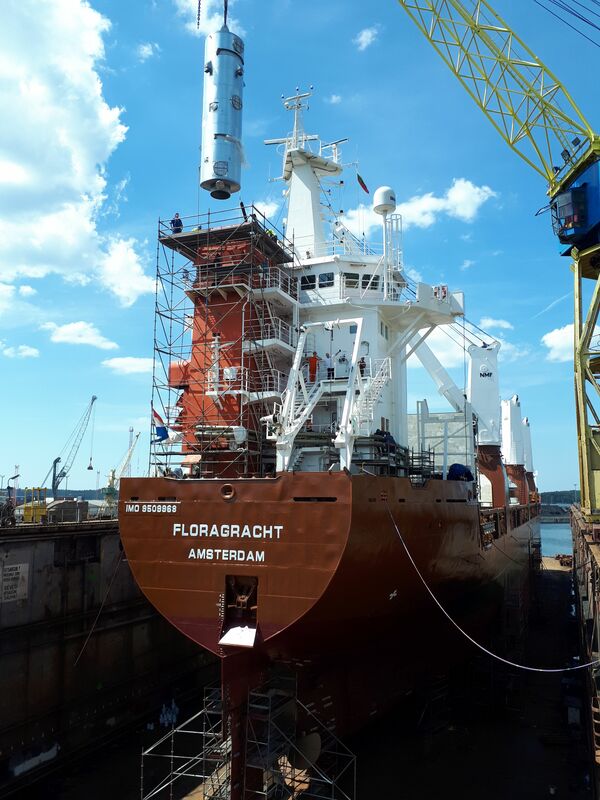 On 26 June Spliethoff’s mv Floragracht left the BLRT shipyard in Klaipeda, Lithuania, where she was outfitted with an exhaust gas cleaning system (scrubber). In the coming period thirty more vessels of Dutch ship owner Spliethoff Group will follow. By building in scrubbers throughout its fleet, Spliethoff Group shows its commitment to cleaner shipping and prepares for the global 0.5% sulphur cap which comes into force in 2020. In 2012, Spliethoff Group subsidiary Transfennica started by outfitting their six Con-Ro vessels with scrubbers. In 2014 – 2015 Spliethoff’s fourteen S-type vessels followed and at the same time sister-company Wijnne Barends fitted scrubbers in three of their C-type vessels. In the coming period scrubbers will be installed on thirty more vessels of Spliethoff, BigLift Shipping and Sevenstar Yacht Transport. In 2014 Spliethoff Group joined the Trident Alliance – a coalition of shipowners and -operators who share a common interest in robust enforcement of maritime sulphur regulations and are willing to collaborate to help bring it about. The main focus of the Trident Alliance is clear communication to raise awareness of possible weak enforcement of the marine sulphur regulations, supported by member companies’ transparency on compliance.